At Penn State: Emotional Memorial Service For Joe Paterno : The Two-Way An estimated 10,000 people attended the service for the former football coach. He died Sunday, at the age of 85. 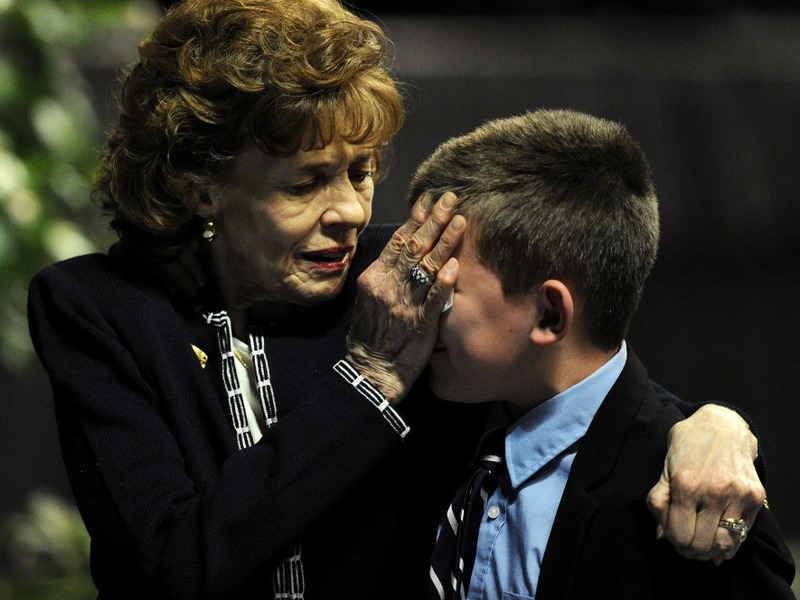 Sue Paterno, widow of Joe Paterno, consoles one of her grandsons following the memorial service. An estimated 10,000 people are a memorial service for former Penn State football coach Joe Paterno, on the school's campus in the Bryce Jordan Center this afternoon. The Big Ten Digital Network is among several outlets that will be webcasting the service. "He won more games than any other Division I football coach in history before being dismissed in November in the wake of the scandal involving a former assistant who is accused of sexually abusing young boys for more than a decade. Paterno was fired because of a grand jury report that said he had informed school officials about an alleged incident involving the former assistant, Jerry Sandusky, but had not followed through or otherwise alerted authorities." We'll update this post with some highlights from the service. As he reaches the end of his remarks, Jay Paterno asks everyone to stand and hold hands they recite The Lord's Prayer. Jay Paterno just said of his father that "faced with obstacles and changes that would have left a lesser man bitter ... he never wavered in his belief, in his dream of Penn State." And, "he never spoke ill and never wanted anyone to feel bad for him." On the morning of his father's death, Jay Paterno said, he was alone with the older man as the elder Paterno lay sleeping. Jay Paterno thought about his dad's life and realized that even in silence, his father offered "one last lesson: the smallest acts of a father, a coach, a mentor, can echo across decades." -- "There is a villain in this tragedy - it lies in that investigation. Not in Joe Paterno's response," he says. Charlie Pittman, a running back on Paterno's two undefeated teams in the '60s, says that "despite being pushed away from his beloved game" and the "extreme pressure" that the scandal brought, "Joe's grace was startling. ... Though his body eventually failed, his spirit never did." Todd Blackledge, Penn State's quarterback from 1980-82, says of Paterno that he was "the most extraordinary person I have ever known." When he thinks of the coach, Blackledge says, he thinks of "TLC." Not "tender, loving care," but "team, loyalty and competition." Members of Paterno's teams from the decades since he became head coach in 1966 are taking turns speaking. The first is wide receiver Kenny Jackson, from the 1980-83 years. "We are hear to celebrate a great man's life," he says, before introducing Paterno's wife, Sue, who gets a standing ovation. Of coach Paterno, Jackson says "he never took a compliment, he always deflected praise. Never thought he was the show. But today my teacher, you have no choice. Today, we are going to show you how much we love you." And they're showing a video of Paterno and his teams through the years, set to Van Morrison's version of Have I Told You Lately That I Love You?